When we found out we were finalists in the Cinnamon TBC awards for the Travel Video Blog category in Sri Lanka, we began researching activities to do during our trip. 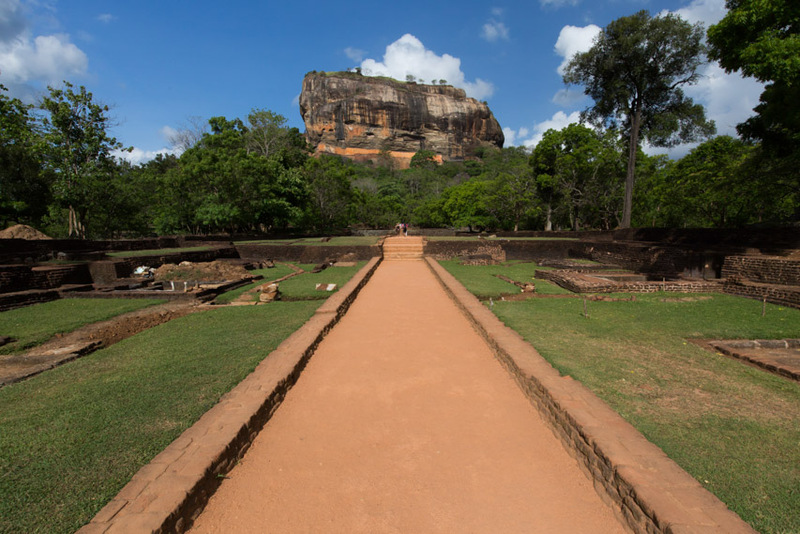 Having never been to that part of the world we had no idea what to expect, but the one area that everyone I talked to said we definitely couldn’t miss was Sigiriya. 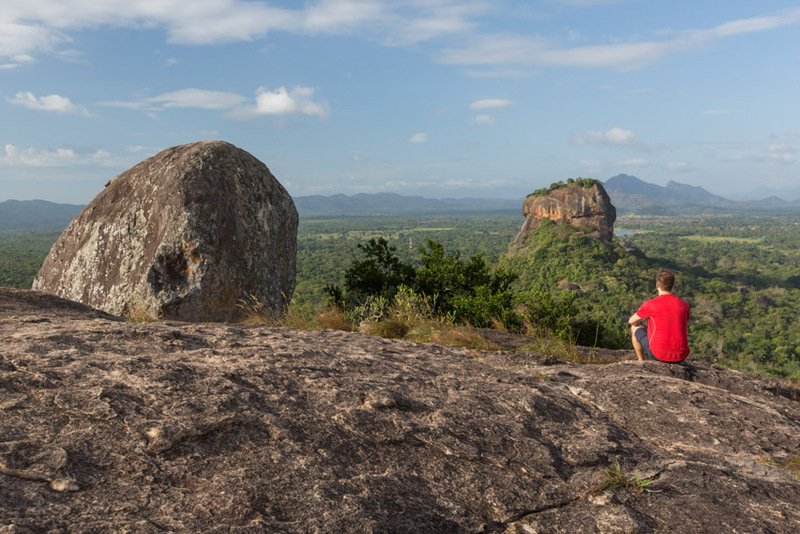 A small township about 5 hours north of the city of Colombo, Sigiriya is most famous for the rocky outcrop called Lion Rock. 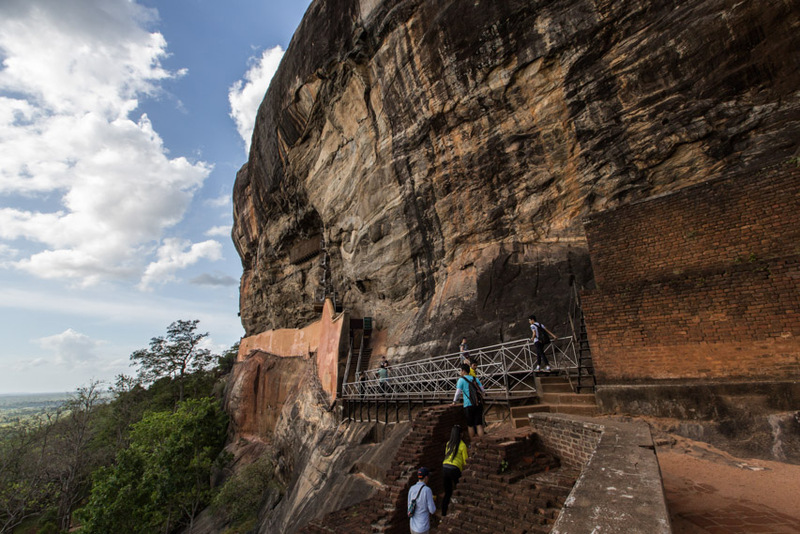 Towering over 200m above lush rainforest, Sigiriya Lion rock was built by King Kasyapa more than 1500 years ago when he fled the city of Anuradhapura after he murdered his father. 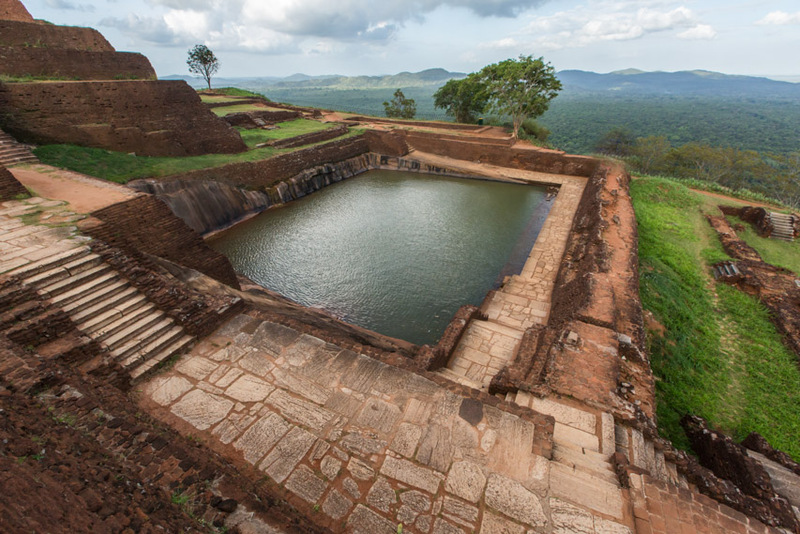 Kasyapa built an ancient city of moats, ramparts and water gardens on top of the rock where he lived an isolated life guarded by a massive gatehouse in the form of a lion. 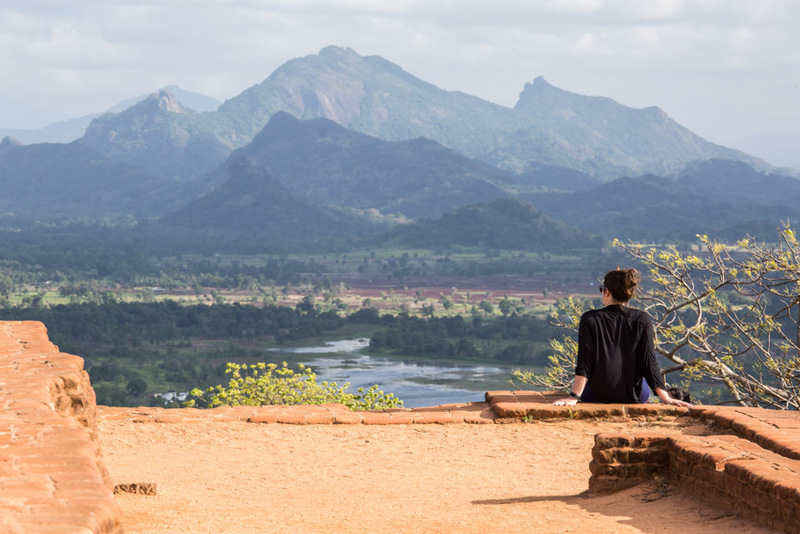 Designated a World Heritage Site in 1982, Sigiriya is Asia’s best preserved city of the first millennium, showcasing complex urban planning combined with sophisticated engineering and irrigation skills in the palace perched on the summit. 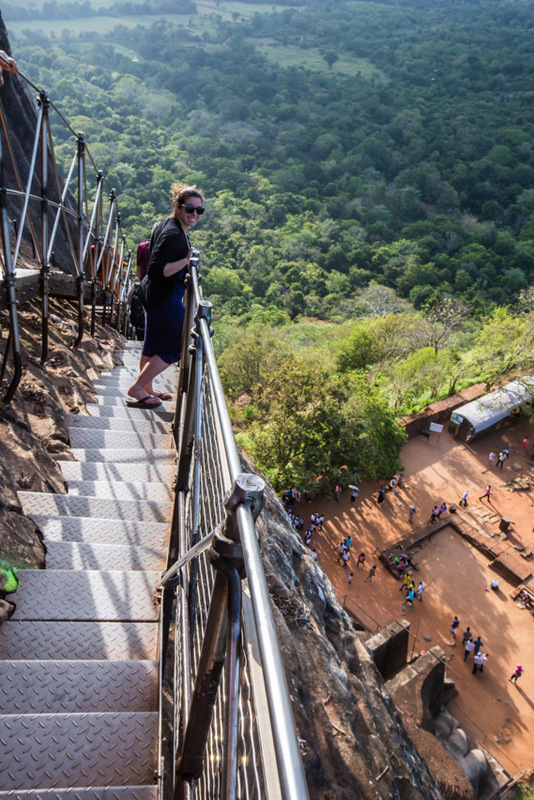 When we arrived at Sigirya Lion Rock it was clear this was a popular tourist stop. After paying the 2310RP ($45 CAD) entrance fee (which felt pretty steep! ), we decided to take a quick detour to visit the museum that shared the history of the Lion Rock. It’s amazing to think that something like this could have been built back in 500AD! With our curiosity peaked, we headed down the stone path towards the Lion Rock and began our ascent through the hundreds of stone steps. 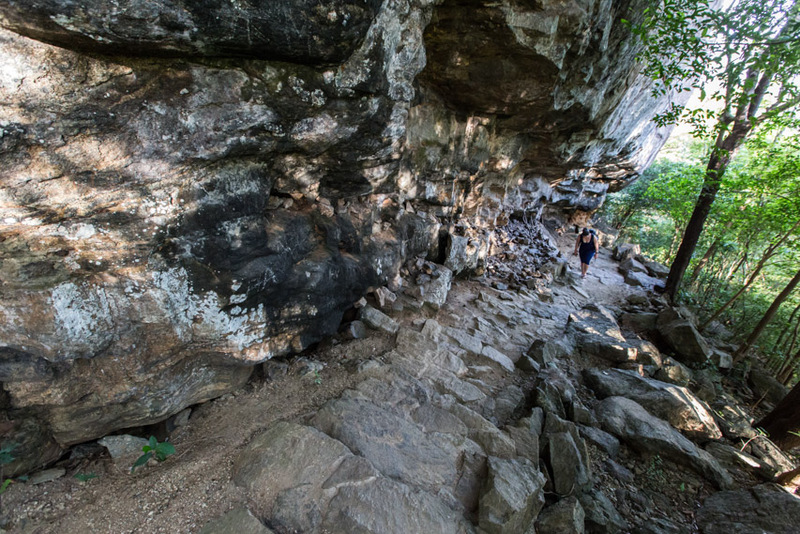 The king had painted the rock with a series of half-naked women to which remnants are still visible along the inside caves of the well preserves walls. They were beautiful but unfortunately no pictures were allowed in this section! As we walked along the staircase cut along the side of the mountain we began to hear the droning sound of wasps. As I looked up I could see these massive black nests hanging above.And these wasps are not to be [email protected] with. We had been warned before we came and the signs all along the path to stay quiet solidified those stories as loud noises can trigger these killer wasps to go into attack mode. This is no joke. There have been many reports of people being hospitalized from wasp attacks here! Let’s just say I was a bit on edge the entire walk. I can walk on the edge of a cliff, skydive without blinking but the sound of a wasp sends me into a panic mode that I find hard to control. This stems from a childhood traumatic event of accidentally walking on a wasps’ nest and being chased by a massive swarm and stung a few dozen times, so do you blame me? At the summit we explored the ruins of the ancient city. It much have been a paradise to live up here with the incredible 360 degree views of the rainforest below. In the distance we could see Pidurangala Rock which we planned to climb the next morning. We walked by the old swimming pool and the King’s throne and imagined what it must have been like to be here 1500 years ago. With the light starting to fade we decided to head back down. It was good timing too as some loud kids were just coming up so I flew down those stone stairs to safety. That night we were invited to stay at a tree house in the middle of the jungle with Back of Beyond! 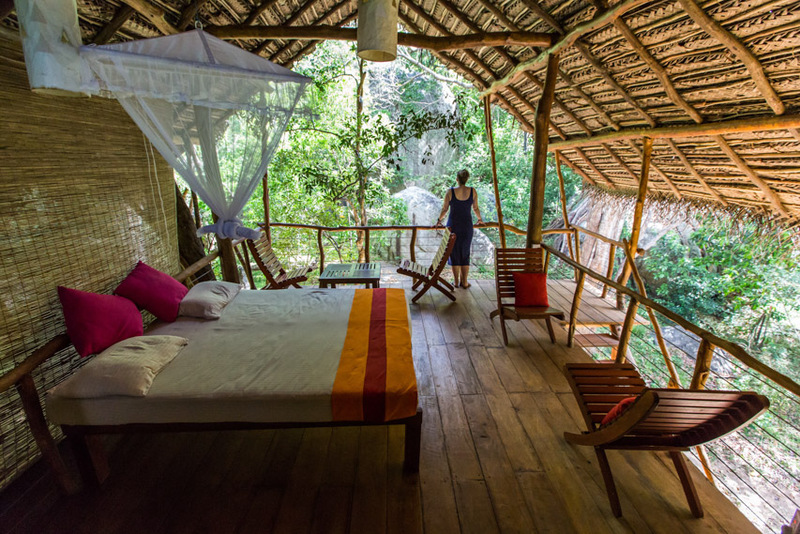 They are an eco-retreat with a number of locations around Sri Lanka, including two near Sigiriya. 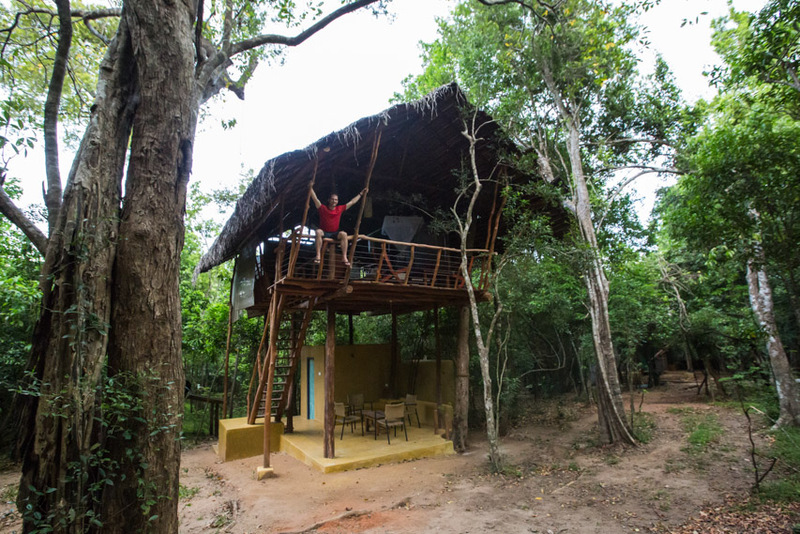 The Dehigaha Ela location has 3 tree houses, 2 boulder cottages (literally built in a boulder) and a family house all in the remote jungle about 30mins outside Sigiriya. I wished we had more than just one night to stay as it would have been great to spend the evening there, but we stayed at the Pidurangala location conveniently located 5 mins from Lion Rock and at the base of Pidurangala Rock. It too was surrounded by native forests and was situated along a path frequented by wild elephants! What I loved about staying at the tree house with Back of Beyond was the little adventures that were close by. The next morning we planned to climb Pidurangala Rock at sunrise which was conveniently a few minutes walk away. Enroute we stopped by a number of ancient ruins and temples. The snake Buddha called the New Temple was a symbol of protection over the people who lived in the area. 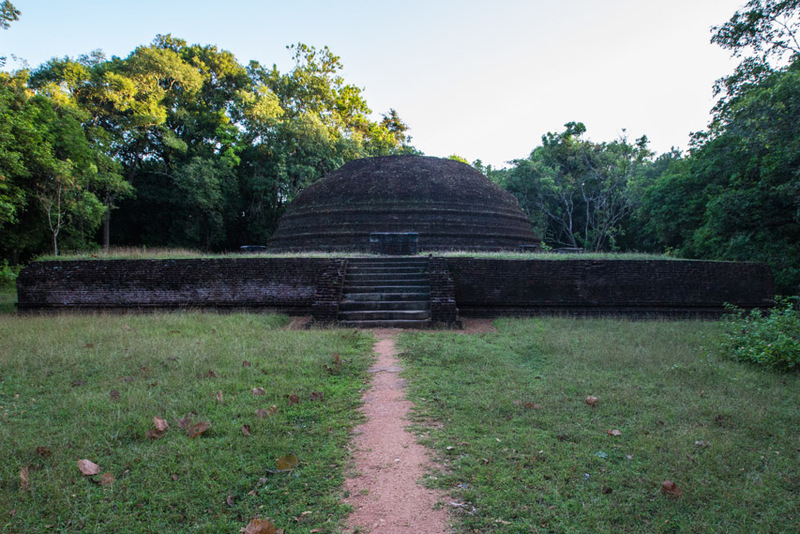 The next was Kasyapa’s Stupa that was the location of where King Kasyapa who build the Sigiriya Lion Rock was cremated. Down the road we came to the entrance to Pidurangala Rock where we paid the local monks 500rp ($10 CAD) to enter. 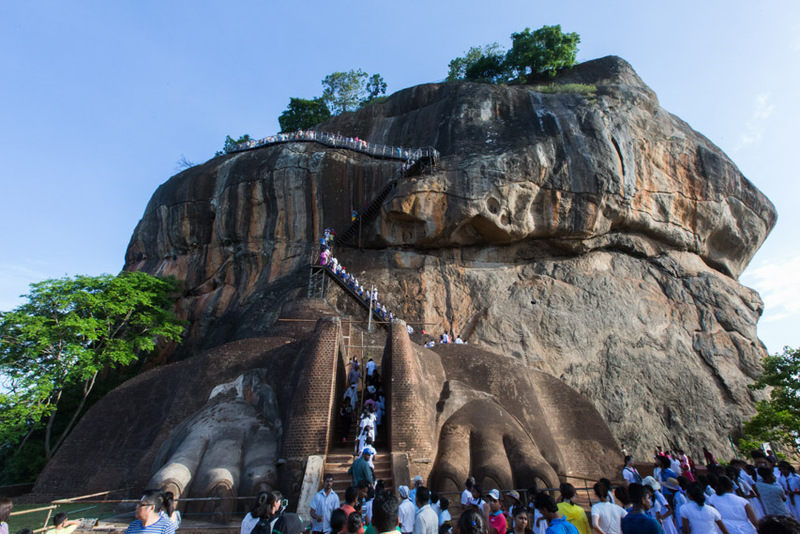 The white Pidurangala Rock Temple sits at the base of the mountain houses a cave temple dating back 1000 years filled with precious Buddhist antiques. 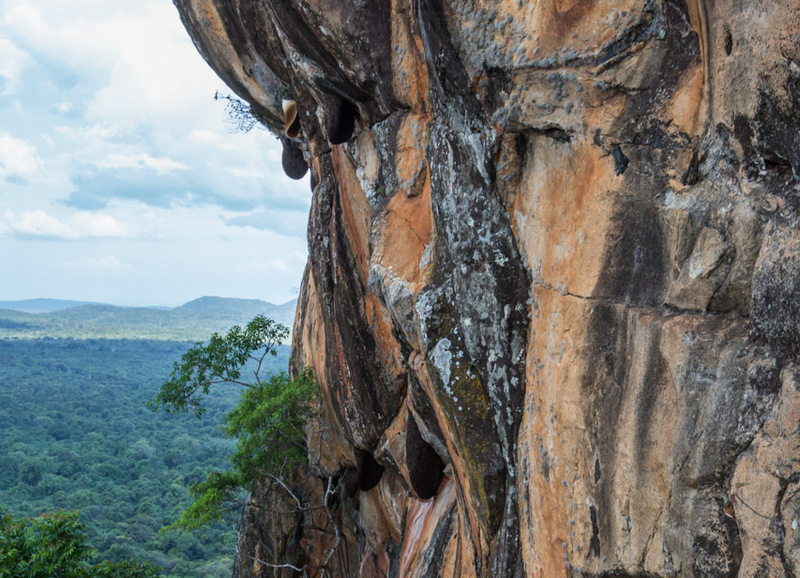 These rock temples are quite popular in the area and their defining characteristic is the drop-ledge on the roof line meant to keep water from seeping inside. The climb begins up a series of steep stone steps, zig zagging through the jungle up the mountain. 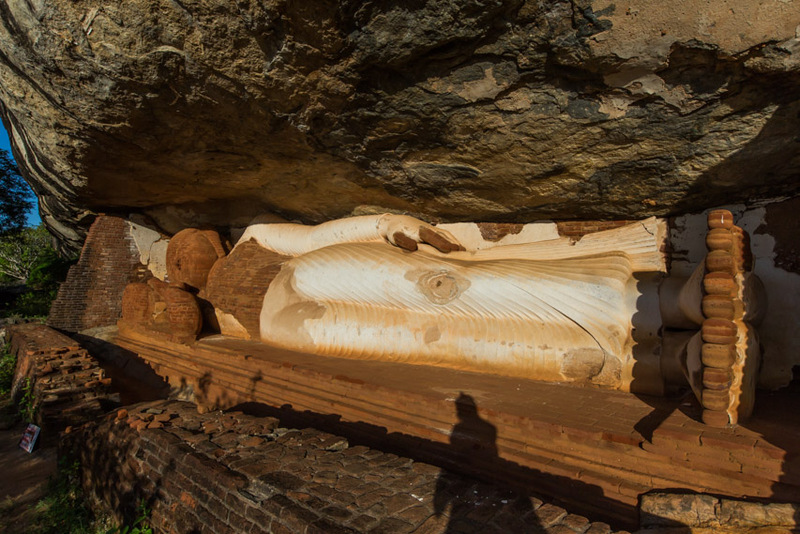 Along the way we passed several ruins of ancient civilizations and a giant 12.5 metre long reclined Buddha that was once the largest brick statue of Buddha in the world! 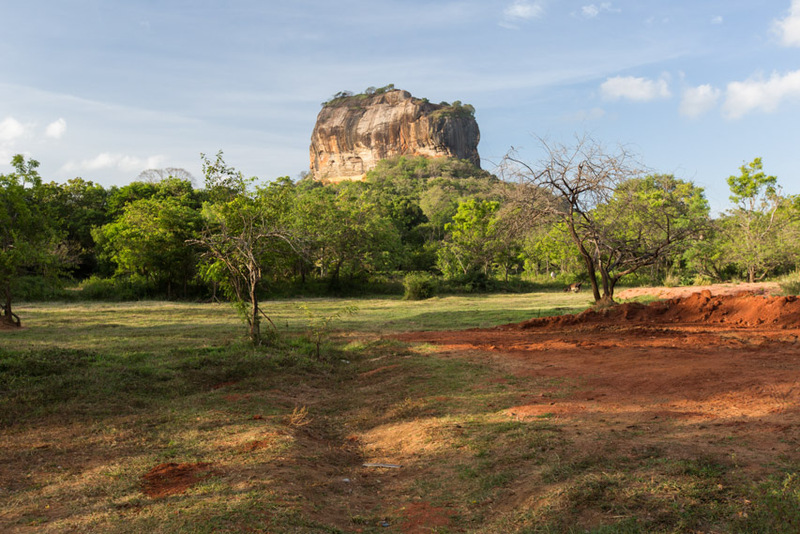 After a final rock scramble to the top we were greeted by the famous views of Sigiriya Lion Rock and surrounding area. From here you can really see why it got it’s name. Can you see the Lion Head? The staircase up to the city was completely empty as it was still quite early and the park hadn’t opened yet. From here you still would never know a secret city lies at the top of that outcrop. We stayed up here for nearly an hour enjoying the view. We could even see our tree house below nestled in the jungle! I was amazed with just how GREEN Sri Lanka was. Lush with rainforests and lakes, it still feels quite untouched. While we were relaxing, our host from Back of Beyond shared some Sri Lankan folklore. 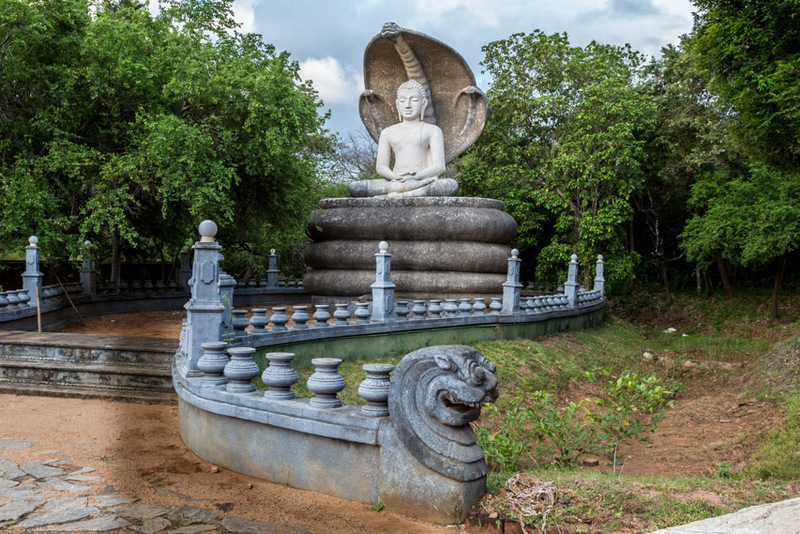 He told us the story of how Ritigala, the ancient Buddhist monastery and mountain range in Sri Lanka was formed. Legends says that an India and Sri Lanka king fought in an epic battle to which the Indian king got injured. He sent his worker monkey to the Himalayas for some medicine, but the monkey forgot the name of the medicine. 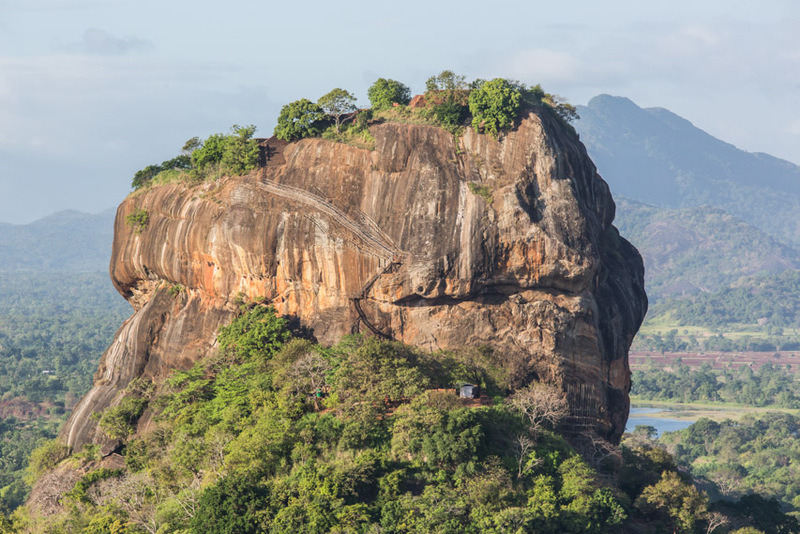 Instead he brought back half the mountain with him and threw it around when he returned, creating the Sri Lanka mountains surrounding Sigiriya. Our 2 days exploring Sigiriya were definitely too short but I was so glad we got to experience some of the beauty and rich culture Sigiriya has to offer. We have a lot of unfinished business left in Sri Lanka so I hope we can return again soon to experience more of the incredible eco-tourism in Sri Lanka! Big thanks to Back of Beyond for hosting us in their awesome tree house and to Cinnamon Hotels & Sri Lankan Airlines for sending us over. Good to see you guys get a well deserved rest along with acknowledgement for all the hard work. Thanks so much Dave! It was nice to have some more relaxed adventures and we were very excited to receive the Gold Award! Love the warning board for the ‘wasps’!!! Wow, what an experience! I love the places you visited and you tell a beautiful story. Seeing and reading about these places is so rich, I can only imagine how great it must have been to actually be in the presence of such ancient history. Thanks for sharing. Glad to enjoyed our blog! You two came to my country! !Where else did you visit ? Great photos. 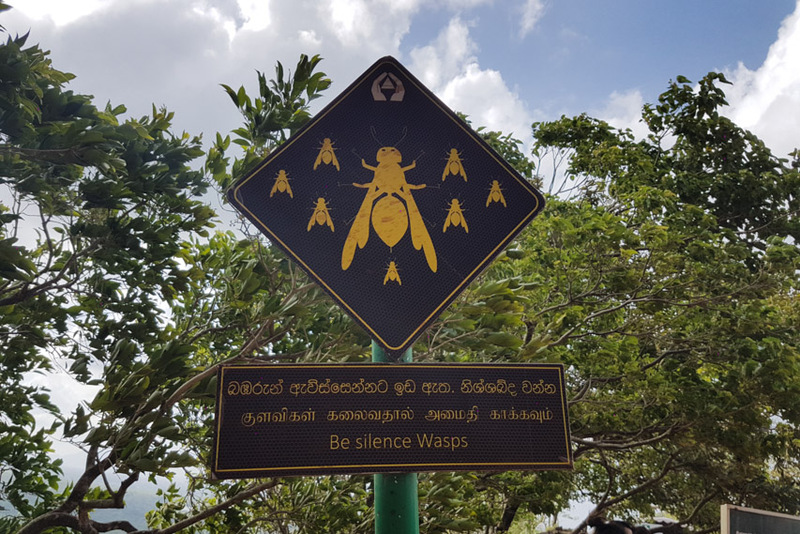 Sri Lanka is a beautiful country…apart from the wasp attacks, looks like a cool place.